An article or even a full book on my mother, Asha Singh (I call her “Ma”), can hardly describe who she is. Having written hundreds of articles over the years, this one is certainly the most intense and no matter how I try, I can only capture a snapshot of Ma. I can hardly define my mother’s love and affection, learning and determination, joy and pride, and moments of her simply being with me every moment of my life in one humble article. Still, on this Mother’s Day, let me try! 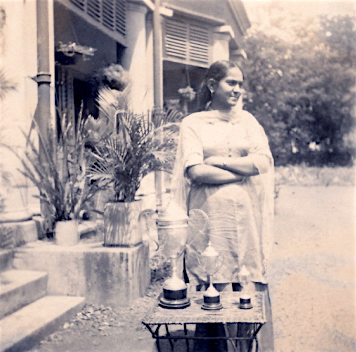 Among my very first memories as a child were the dozens of shiny trophies at our home that Ma had won during her college and university days. Ma has always been an ace debater. She had represented her college and university (Ranchi University) at the national level. She, of course, had won those amazing trophies by winning several of the competitive debates across cities, states and at the national level. Being a natural leader and fierce orator on the debate team led her to win multiple championships. Ma studied economics at Ranchi University and could discuss in-depth economic issues and detailed public policies with anyone on any level. She formed her own opinions and had her own beliefs. Ma graduated from university and was prepared to strike out on her own. She would no doubt be a world class economist or a strong public policy leader to this day had she not chosen to leave that path and take on a more important role—marrying my father, Papa, and raising a family. Ma gave up her own career opportunities to take care of Papa, myself and my two brothers. The sense of belonging and immense sacrifice of her own is something that none of us have ever been able to fathom. Ma and I, years ago of course! When we were very young, Papa fell severely ill. Ma dropped everything to be with him for his treatment. Ma was at his side twenty-four hours a day. We lived in Patna in those days and the treatments took Papa to Delhi, Chennai and Vellore. Ma went with him every time, for lengthy treatments, several months at a time, over a period of two years. Our grandmother, uncles and aunts stayed with us and cared for us during the difficult long distance hospital stays when our parents were gone. We had no phone in those days, so Ma would write letters to us from the hospitals. Her letters had updates on Papa’s health, written so we could understand them at our young age. 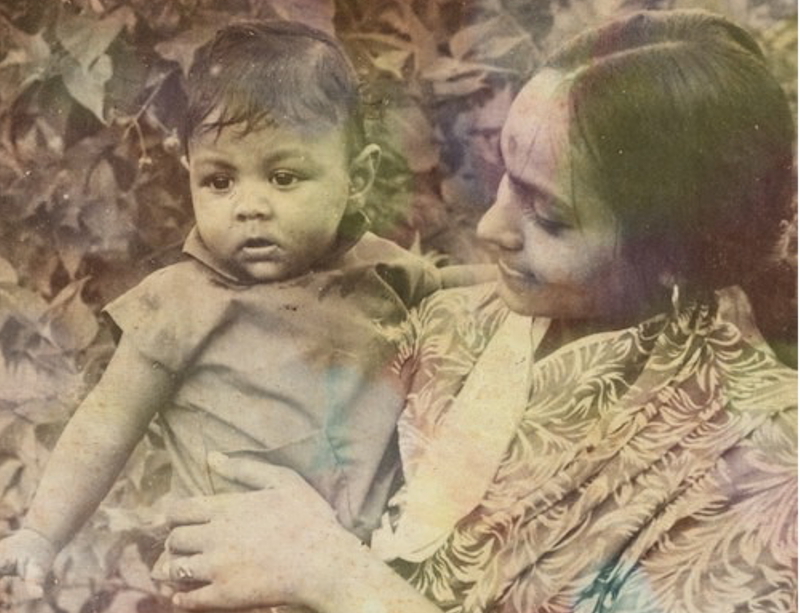 Though they were often matter-of-fact, I always sensed immense love in my mother’s letters. We three brothers drew strength, resolve and patience from these letters. That is the real meaning of total commitment. Love in action is one of many things I have learned from Ma. Later, when Papa recovered from his illness, we moved to live in the Patna Medical College and Hospital campus (Papa, being a doctor, got an apartment there). Our apartment was on the top floor of a two-floor building and was among six other apartments with six more families of doctors. I was getting a little serious about my studies as I was in the middle of 9th grade then and needed a quiet place to do my studies. There was none in the main apartment where we were living. The apartment building had a public staircase and we converted the section under the staircase as my makeshift study-room. It was definitely not meant as a place to study. Footsteps constantly went up and down the stairs and all the children even jumped on them! It was all I had and it was surely important to study to prepare for my 10th grade board exams. I was frustrated and complained to Ma often, “It’s so loud! There are too many footsteps. I can’t even concentrate to study!” She heard me complain a couple of times and one day said, “If you have a sense of purpose in what you want to achieve, you won’t hear the footsteps and noise.” That powerful thought has stayed with me ever since. I moved to Bombay in 1983 to join IIT Bombay. Ma was more thrilled than all of us combined. I used to talk to Ma, Papa and my brothers on long distance trunk calls and write letters to them. In my third year, I came home during summer vacation. Normally Ma would be the first person to be at the door to meet and give me a big hug. This time, she did not receive me and I went looking for her, only to find her in her bedroom, lying on the bed with a fractured leg in a sling. I was shocked to see Ma in that condition. Later I asked, “What happened and when?” Papa and my brothers told me Ma had slipped in the bathroom and fractured her leg four weeks ago. I said, “Four weeks ago! Why didn’t you tell me before?” Ma and I had talked every week before I came home. Each time Ma would say, “How are you? Are you eating well? Take rest. Your exams will be fine.” Words from a loving mother to her son. Not once did she or anyone else tell me that she was lying on the bed with a fractured leg. Papa said Ma had strictly asked all not to let me know since my semester exams were just around the corner. When I learned this, all I could do was hug Ma for a very, very, very long time, not counting my tears, just letting them flow. About ten years ago, I had gone to see Ma and Papa in Patna. The trophies Ma won for debate are still proudly displayed around our house. During that visit, Ma presented me with a box full of letters I had written to them during my IIT Bombay days, from 1983 to 1987. I had written over 100 letters during those four years. Ma had kept every single one of them. What can I say? When I touched those letters, my emotions took over. Only Ma could stir up that kind of intense feeling. Ma is simply amazing. Ma never ceases to surprise me. Like a sapphire, she has amazing facets. She is not one person, she is many. Moments with Ma are like turning pages on a well-read book. I come to a page I’ve read before, but wait—there’s something I missed. There is always something more to learn from Ma. Touched! Is all I can say. .It does need a tough Mother to create great people.. Achievers. . Mothers don’t take the lead all the time like Fathers do however She is just there when we need her the most! Happy Mothers day! Couldn’t stop my tears.I salute to your ‘Ma’. Thank you for sharing the world of Ma-love,intelligence,strength,dreams,courage,sacrifice and so much .Gods gift to mother’s is to live through their kids . Thank you for your very kind words, Jayashree. MOM is a living god to everyone. Thank you for sharing very touched and I can recollect some of my memory while reading. Very nice that this brings back thoughts for you. Thank you for reading. Hats off for so wonderful and touching portrayal of Ma’s unconditional and selfless love. Emotions have a ripple effect…I felt it. Very touching!